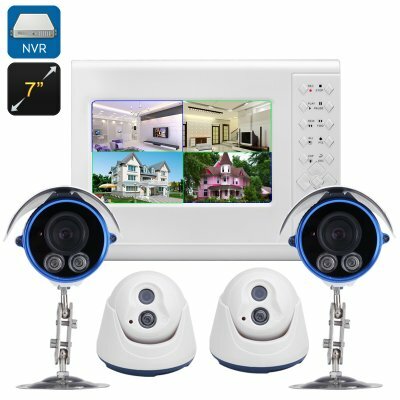 Successfully Added 4 Channel NVR Kit - 2 Indoor + 2 Outdoor 720P Cameras, PoE, 7 Inch NVR, Night Vision, ONVIF 2.0, SATA to your Shopping Cart. Protect your home or office with this 4 Channel NVR Kit that includes 2 indoor and 2 outdoor 720P IP cameras. With 1/4 inch CMOS sensors and a 15 meter night vision the day and night cameras will act as a sentinel guarding over your home 24x7. With this NVR Kit you can enjoy remote monitoring of the camera feeds by simply setting up the system on the cloud services website. So no matter where you are, as long as you have internet access you can connect remotely and get a full view of the situation at home. The extra level of security that this NVR kit brings to your property will help reduce insurance premiums and act as a deterrent to any would be thief so you can rest easy. This complete NVR surveillance and security system comes with a 12 months warranty, brought to you by the leader in electronic devices as well as wholesale CCTV security systems..